t’s the weekend or your dentist is out of town and your tooth has gotten a hole in it or part of it has chipped away. Now what do you do? Call your dentist to schedule a visit. They will probably ask the following questions. Where is the problem at? How long has it been broken? In the mean time don’t chew on that side. 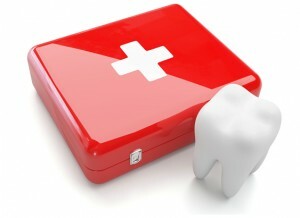 A broken tooth is a weakened tooth. Stressing it out more and breaking more of it can mean more expense. If it’s cutting your gum or tongue you can get some bee’s wax or some temp material from the drug store. A word of caution, sometimes plugging the hole can give you a toothache. Your tooth may be naturally releasing pressure through the top of it where the hole is. Plugging the hole may cause pressure to go down into the root. Patient tends to grind or clench teeth. Patient is eating or chewing on things that are beyond the design and function of your teeth. For example popcorn kernels, ice, or frozen M&M’s. Remember teeth that are more than 50% filling are significantly more susceptible to failure. We will be able to help you decide what to do in order to protect your tooth in the future. This may include replacing the filling after removing the decay or a crown. If you’re suffering from a dental emergency, contact us at (513) 896-1573 today to get you in ASAP!